Letting the Days Roll By……. Warning – photo heavy post. Hello strangers! 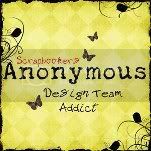 I had a lovely surprise this week – being picked for the Counterfeit Kit Challenge blog Follower Showcase. Lisa said such lovely things about my pages and included a link right here to my blog – that’s when I realised how long it has been since I have written a blog post. 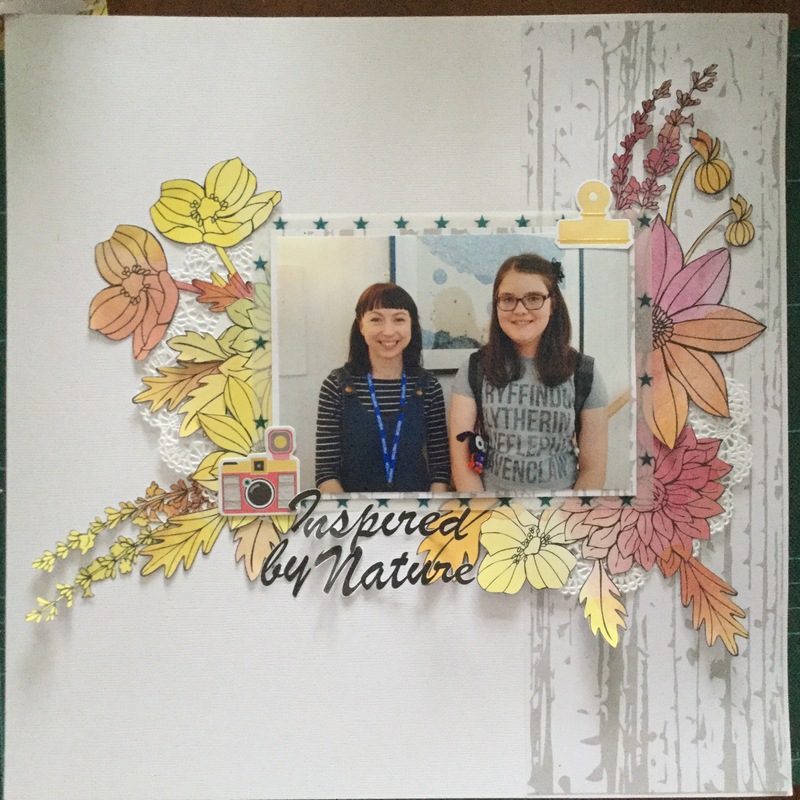 I have been scrapping – I’ve been to the GoGo Getaway 10th Anniversary crop where I met Shimelle, A Birds of a Feather class with Vicki Boutin and our annual Bloggers weekend away, as well as taking both of Shimelle’s new classes. I’ve been posting pictures of my pages on FaceBook, but since the CKC link might send some visitors I think I should share a few pages here too. Hello, I’ve been away a long time I know but there’s a very good reason for that – I’ve been very busy scrapping. I’ve been taking Shimelle’s latest course – Clear the desk. In it she presents strategies for creating and using kits from your own stash. A crash counterfeit kit course if you will! There were 4 variations on the kit selection techniques and I’m almost through my third kit, with a total of 14 pages – all but one using Disney photos. I flicked through my 2006 album Disneyland Paris album last night and I am most certainly on the home run. 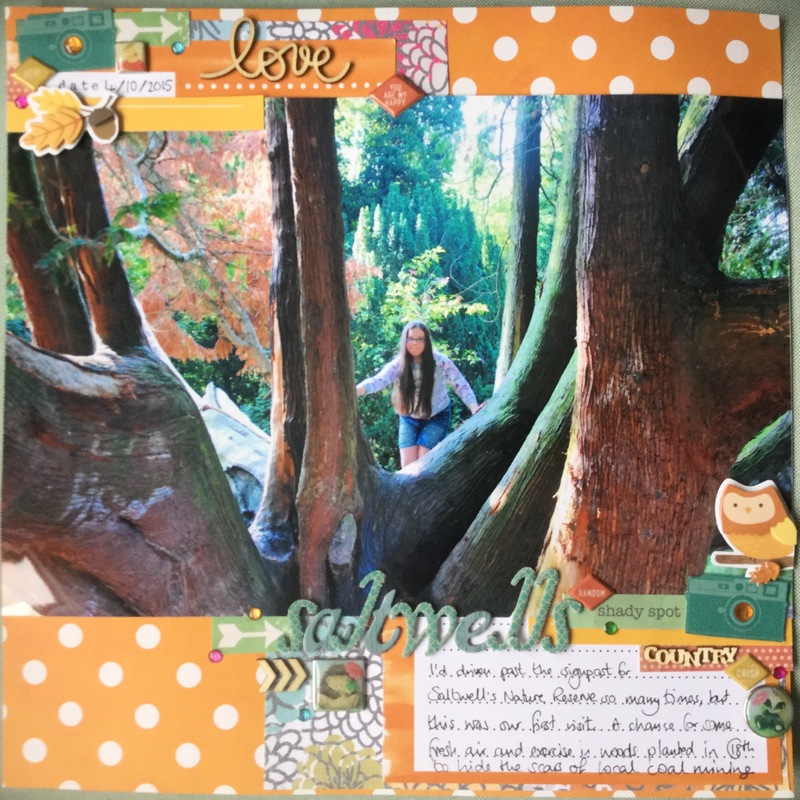 I have a couple to finish on my desk and a couple in the album which need some journaling (truth be told one needs a bit more embellishment too) and then I just have just four pages left to do to finish the album. That is my scrappy goal for this Easter holidays. 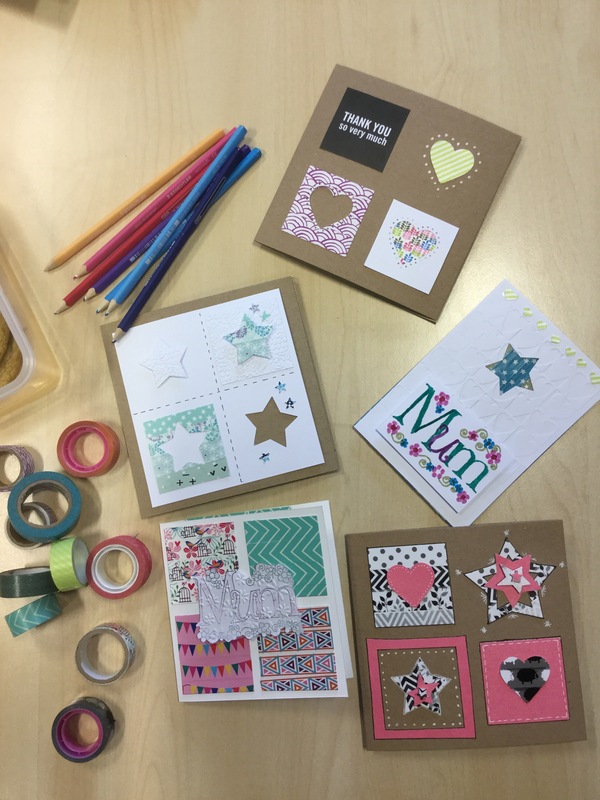 In other scrap related news I held a card making class at work, as part of our Be Inspired fortnight, where we are encouraged to share our hobbies. We used a sketch from Stick it Down and one of my colleagues blogged about it here. Before I go I should share some LOs. It’s so rare they include me that I’ll start with those. This one is for this month’s Challenge Yourself bingo challenge. I used stickers, diecut and of course a photo of me – this one is with Russell and Dug from Up. I kept that one clean and simple, but I went with a bit more embellishment with this one of us with Pocahontas. Strawberry said I should have called it ‘Colour with the wind’ with all those leaves swirling round. I love how the dark brown woodgrain leaves under the blue and yellow ones look like shadows in the photo. Finally, sticking with the more outdoorsy theme, here’s my big photo LO. I love the light in this photo and if I’d stuck with a smaller size photo Strawberry would have been completely lost. I treated myself to Shimelle’s offer for an annual pass for her courses, so I see a very productive scrappy year ahead of me. P.S. Clear the Desk has left me with an even messier desk than I started with! I enjoyed the coffee challenge last month at Kraft+, so I thought I’d check out this month’s challenge and what do you know? This month is to be inspired by ABBA. I still have my photos from our trip to see Mamma Mia in Birmingham in 2016 waiting to be scrapped – perfect. I wasn’t sure what papers to use with the kraft card stock background, until I came across the Basic Grey Adrift collection in my stash. I thought the nautical theme would be perfect for a musical set on a Greek Island and the colours went will with the photos. It’s a very simple page, but I’m happy to get a special memory in my album. The January 1 sketch at Let’s Get Sketchy is perfect for using 3X4 cards like the ones I forged for my kit. I’ve had this LO in mind since I saw it but I’ve been distracted by other projects (including this one for Kraft+ using the same sketch). I did quite well sticking within my counterfeit kit for this page. I had no problem with alphas for the title, since that was provided by my 3X4 card and the only things I added were the white star stickers (I could have punched some from white card) and the Christmas tissue paper I used in my Traditions LO. Even though they will be in different albums, I didn’t want this one to look too much like my Cocoaflakes LO, so I left a narrow border at the top left of the LO and added my journalling with white pen around the edge of the page. I have two more large photo Disney LOs to share from this kit (both started on New Years Day) and then it’s about done and I’ll be ready for February’s Counterfeit kit. Have you seen the sneak peaks on the Facebook page? It looks like it’s going to be a pretty one next month. As soon as I saw the sketch at Let’s Get Sketchy I new that it would be a great use of a 3X4 card from my CKC forgeries. Then I saw the challenge at Kraft+ and I knew I had to use the coffee and twinkle lights card. The challenge at Kraft+ is to scrap about coffee using kraft card stock for the base. My CKC kit contained coffee cup pp and it was about time I used my coffee stain stencil. I went with a photo taken at Costa during a Christmas shopping trip, of Strawberry’s festive chocolate flake cake and hot chocolate replete with cocoa powder snowflake. I pulled in a doily and few stickers from Shimelle’s Glitter Girl collection. I punched some mini snowflakes from the blue of the coffee cup paper and made some holly leaf embellishments using a stamp and some red gems. It took me a long time to think of a suitable title for the page. I eventually went with cocoa flakes – for the cakes and the cocoa snowflake in the photo. My page was almost done when disaster struck. Can you see it? I dropped my ink pad on the LO! The page was covered in inky splodges but these are straight lines and I needed a way to cover them up. I wasn’t sure what to do about it. The design didn’t lend itself to covering the area with patterned paper. I slept on it and decided to try snowflakes punched from Kraft card. I put a couple over the ink pad lines and then scattered a few more across the page. I think that does the job nicely. I’m getting close to the end of my Counterfeit kit now and I did some more scrapping last night and this morning. This is the title page for my Disney Christmas album, inspired by Shimelle’s Most Magical Scrapbook course. I chose the pink snowflakes paper to co-ordinate with the pink of the castle and pulled in some extra stickers to cover the overcast sky and a shrinkles Santa Mickey as the focal embellishment. I had to stick him to the white floral wreath card with diamond glaze because he wasn’t quite flat. I’m linking this with Studio Challenges, using snowflakes/winter theme. 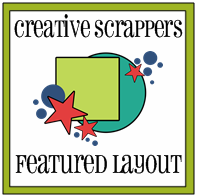 There’s just two more big photo pages to complete and a different version of the Lets Get Sketchy challenge to finish (so that I can link up to their site with that one, because Kraft+ don’t allow entries to be linked to other challenges) and then I really will be down to just scraps. It’s all laid out on my scrap table and I’m determined to get it all wrapped up this weekend. What do you have planned? Christmas may seem a long time ago, but my CKC kit contains a few Christmas items so I decided to scrap the photos from our annual trip to the Birmingham German Market to get it used up. The German Market is becoming a family tradition. We always have a bratwurst and a photo with the Bull Ring Bull in its Christmas outfit. I take very similar photos every year but I haven’t scrapped many of them, so I went with a 12X12 page and a 16 pocket divided page protector. I used the 15 Jan sketch from Stuck?! and I’m really pleased with the way it turned out. I made the 12X12 background with white card stock and gutted the plaid patterned paper at the beginning of the month; so that I could make my forgeries and cut out the little house for my 2018 Goals page. I’m not quite so keen on the pocket page but it is growing on me. I have eight more photos; close ups of the market stalls to fill the reverse of the pocket page, but I’m still thinking about what to do for the other pockets. I’ve put the pages in my album for safe keeping and I noticed that the pocket page is larger than 12X12 and my American Crafts ring binder is only just big enough for it. 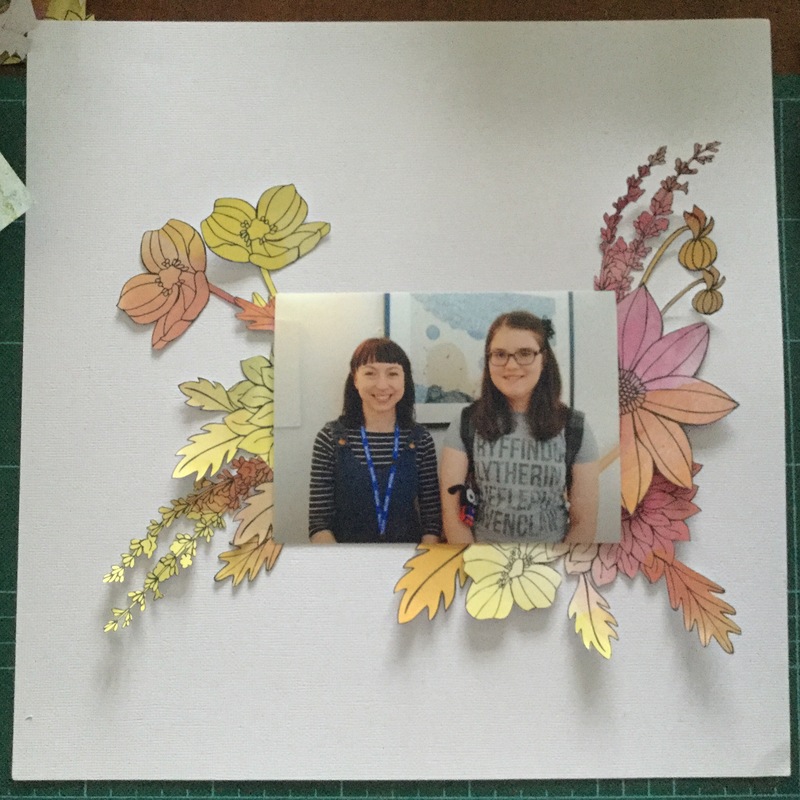 The divider is October Afternoon, so if anyone knows where I can get a slightly larger album than standard please let me know. I’m doing really well with this kit. That’s 7 pages done and one almost there; plus another 5 half done. That will be 13 in total when I’m finished. I hope to get them all done for next weekend to share before the January linky closes. Are you ready for Challenge 2 at CKC? 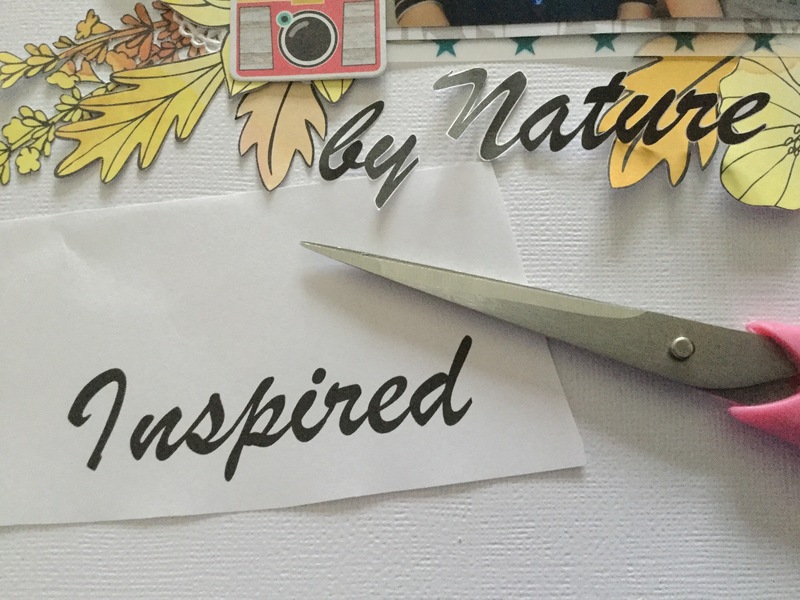 Inspired by nature is such a perfect challenge for this kit when it includes the watercolour and ink floral paper from Amy Tangerine’s Sketchbook collection. And I knew exactly what I wanted to scrap about. I decided to go with a white cardstock background and fussy cut the flowers to frame a photo of Strawberry and Louise; taken on the staircase in front of one of her pictures. That’s better, but I was worried about filling the space between the flowers on the left, so I cut one more flower from the Sketchbook paper and grabbed a doily before I started sticking. I wanted to try a hand cut title. My initial idea was to try emulating the lovely white script titles Miss Smith hand cuts for her pages. I printed the title onto paper with the idea that I could put the pieces together somehow to form a single piece and then cut it from white cardstock. I’m thinking maybe some splatters and enamel dots to finish it off? Or maybe some Louise inspired doodling? 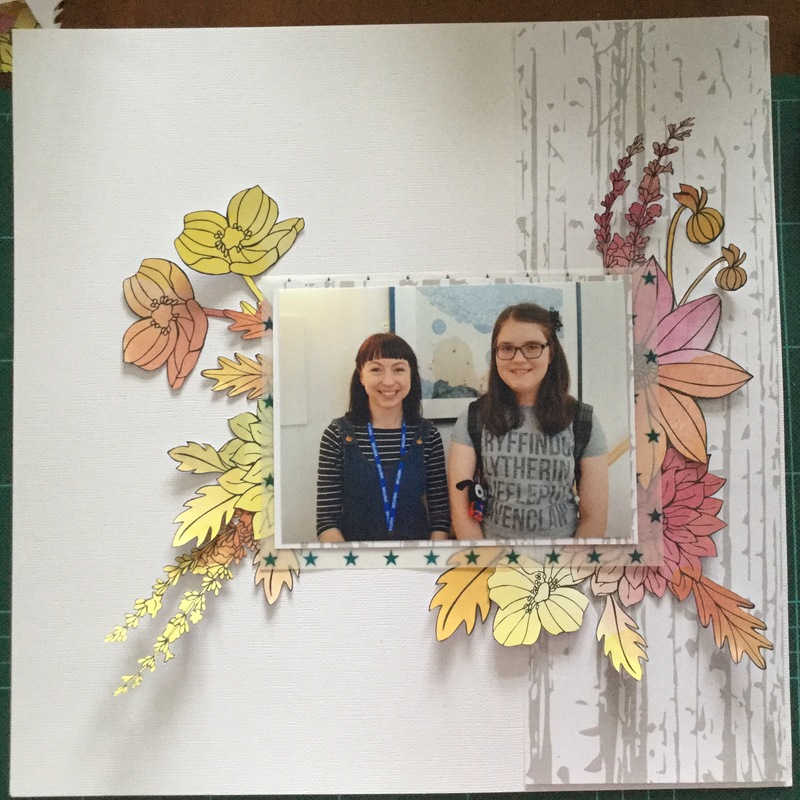 I’m also planning a pocket page to go opposite, with more photos, journaling, 3X4 water colour PL cards I made for the kit, Louise’s business card and my sketching from the day. I have more nature inspired art for this section of my album. The following day we went to Yorkshire Sculpture Park, Strawberry did more water colour painting and I took lots of photos. If you would like to see more of Louise’s art, her instagram is @louiseannwrightartist. Maybe she’ll inspire you to join the challenge too. If you are in the area she is also exhibiting as part of the Vs David Bowie exhibition at The Civic, Barnsley until 25 February. We’ll be going if we make it up there at half term.